Last month Cinerati was chatting with Kevin Roderick of LA Observed about the various hidden treasures that can be found in Los Angeles. Eventually, the conversation turned to Los Angeles' famous funicular Angel's Flight. The funicular has been closed since February 1, 2001 after an accident resulted in one death and 7 injuries, but it has been an iconic LA landmark featured in a number of films and television shows. One might argue that no visit to LA is complete without a quick ride up the funicular. Sadly, Cinerati has never had the chance to ride this historically important attraction. We have desired to ride the funicular since seeing the Burt Lancaster noir film CRISS CROSS, and the 1955 version of KISS ME DEADLY, in both films the inclusion of the funicular added greater verisimilitude to the atmosphere of the film. Cinerati moved down to Los Angeles in August of 2000 and by the time we had settled into the city and could make the time to visit the funicular, it had been closed down due to the aforementioned accident. Thankfully, this may soon be remedied. According to LA Downtown News, the famous funicular might open "soon." How long soon is isn't exactly clear, but one can guess it is less than the 8 years we have already waited to ride the contraption. In a city as automobile centric as Los Angeles is, there is something special about being able to take a quick ride on something that has been around since 1901. Note: The image at the start of this article is from the 1955 version of KISS ME DEADLY. 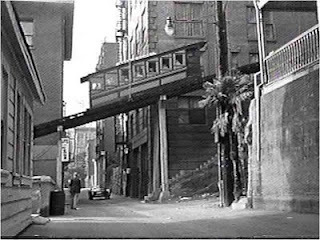 The screen capture came from Electric Earl's ANGEL'S FLIGHT IN THE MOVIES PAGE. Check out the page and buy Images of America Angel's Flight book.